Requests to improve existing CNC equipment are commonly received. One request was to allow as many multiple holes to be drilled in one machine command as possible. The application required drilling many thousands of holes per article. By applying a Three Spindle Drill Head to the existing programmable machine tool the total operation time per article was reduced over 50%. The customer decided that three spindles was the best multiple spindle drill arrangement based on the pattern required. In some cases, multi-spindle heads have been made with up to twelve spindles for similar multiple hole applications. In this application, the customer's machine could feed the gantry in the Z axis to drill and only needed a multiple spindle head with a simple drive mechanism. AutoDrill designed and supplied the drill head directly coupled to a three phase high speed motor as the drive for less than $2500. 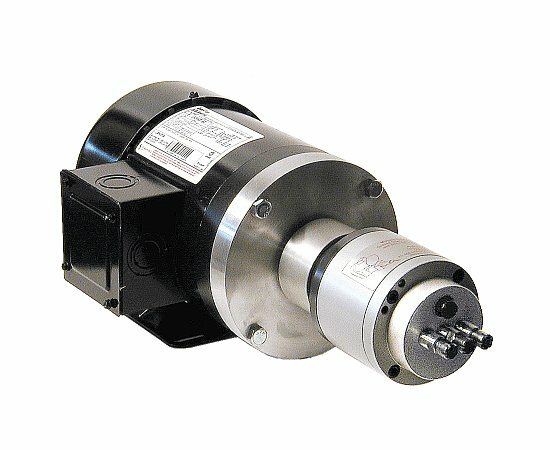 The only requirement to install the multi-spindle drill head was to mount the unitized drive with drill head.